This unit begins by discussing the real world applications using the approximation of parabolas. In the next section students will be given a quadratic equation in standard form (y = ax2 + bx + c) or in vertex form (y = a(x-h)2 + k). From the equation they will set up a table of values and use this to graph the parabola by hand and then using online graphing software. Once students know how to set up a table of values and graph the functions by hand and with using software they will be encouraged to interpret the effects of the different parameters. Students will also look at examples of Quadratic Relationships that are found in real-life situations and interpret their charts and graphs. When making major purchases such as cars, homes and recreation vehicles, the cost of borrowing increases because the interest is compounded. Likewise, when interest is earned on interest, we say the interest compounds. The first topic of the unit will be an exploration of compound interest examples, problems and how to use the graphing calculator to solve them. Then the next part of the unit will be done as an assignment - students will be investigating various financial institutions and comparing their services, costs, charges etc. In the last one third of the unit students will look at the financial advantages of buying a new vehicle, a used vehicle or leasing a vehicle. Welcome to the wonderful world of Data Management. Whether students are interested in sports, business, travel or just working with numbers they will see applications for the skills taught in this unit. Students will be gathering data, designing questionnaires, conducting surveys, interpreting and analysing findings. The unit begins with an investigation of the various methods of surveying a population. Next the design of the questionnaire to collect data will be examined. Bar graphs or histograms and circle graphs are used to represent data. Then students will also use software to display data. Students will analyse their findings and assess their reliability. Students will also begin an exploration of probability and relative frequency. We take a look at different ways of picturing solid shapes. We use isometric, perspective and orthographic methods to represent 3-dimensional objects. We investigate the nets of shapes, and also look at applications of geometry in design, art and architecture. A3 describe and represent exponential relations, and solve problems involving exponential relations arising from real-world applications. B3 interpret information about owning and operating a vehicle, and solve problems involving the associated costs. 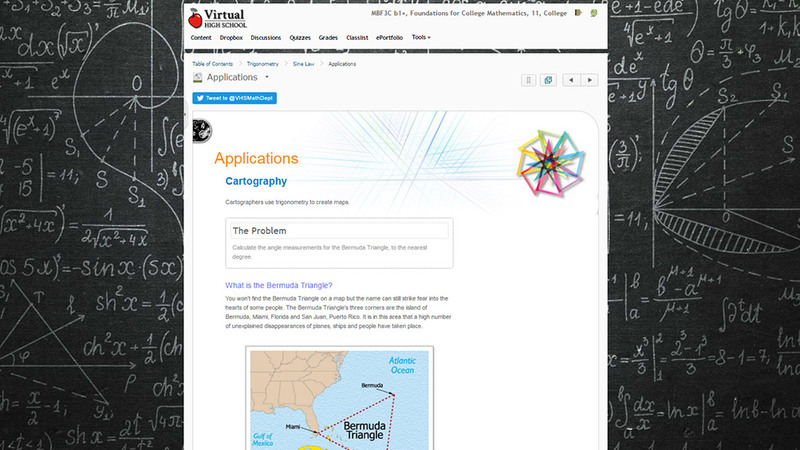 C2 solve problems involving trigonometry in acute triangles using the sine law and the cosine law, including problems arising from real-world applications. D2 determine and represent probability, and identify and interpret its applications. Problem solving: This course scaffolds learning by providing students with opportunities to review and activate prior knowledge (e.g. reviewing factoring techniques from prior mathematics courses), and build off of this knowledge to acquire new skills. The course guides students toward recognizing opportunities to apply knowledge they have gained to solve real-world problems. Connecting: This course models the use of software for personal finance to familiarize students with available software and resources which will allow them to simplify calculations in order to better and more accurately manage money.